There’s more and more evidence, such as the exhaustive study conducted by the UK Medical Research Council, that the nutrient content of our commercially grown food products is in sharp decline. In fact, it is estimated that the nutrient value of our fresh food produce, such as fruit and vegetables, has fallen by a dramatic 30-60 percent over the last fifty years. This is due to a combination of factors, including genetic dilution, which focuses on the quantity rather than the quality of our crops, and the large-scale use of pesticides, herbicides, fungicides, hormones, heavy metals and antibiotics that results in soil degradation as well as the contamination of our food. Enjoying a healthy, balanced diet rich in the vitamins, minerals and other nutrients that our body needs is thus increasingly difficult to achieve. Which is why so many of us are turning to superfoods – pure foods that are by definition low in calories and rich in wholesome nutrients. Organic chlorella powder is one such superfood that, with its extraordinarily high nutritional content, makes a particularly attractive addition to our daily diet. What is organic chlorella powder? Organic chlorella powder is a super green supplement that is made from a special type of unicellular, green freshwater algae. Super greens are a sub category of super food that are instantly recognisable from their characteristic green colour. Super greens include vegetables, grasses and grains, such as kale, chard, rocket, broccoli, wheatgrass and barley grass, and a selection of algae, including spirulina and chlorella. Chlorella was first discovered by Dutch microbiologist, M. W. Beijerinck, in 1890 and was originally produced as a valuable source of protein (chlorella consists of around 45 percent protein). Its name is derived from the Greek word ‘chloros’, which means green, and the Latin diminutive suffix, ‘ella’ which means small. Yet, despite its tiny size – chlorella is microscopic, with a diameter of between 2 and 10 micrometres – it is packed with an incredible range of beneficial nutrients in addition to protein, including vitamins (A, B1, B2, B6, B12, C and E), minerals (calcium, magnesium, iron, phosphorus and potassium), amino acids, nucleic acids, antioxidants and chlorophyll, the naturally occurring pigment that gives the super green its vivid colour. Indeed, organic chlorella powder, made from drying chlorella at low temperatures, is considered such a prized source of nutrients that it is often referred to nowadays as ‘nature’s multivitamin’. Perhaps unsurprisingly, organic chlorella powder has been linked to a number of important health benefits, some of which are investigated in more detail below. The typical Western diet exposes us to more toxins, such as flavour enhancers, food colourings, pesticides and preservatives, than our body can either handle or remove. This leaves us feeling under the weather and can trigger a wide range of unpleasant symptoms, such as headaches, migraines, lethargy, skin conditions, allergies and menstrual pain. Left unchecked this steady build-up of toxins may even lead to a number of chronic illnesses including obesity, arthritis, depression, heart disease and cancer. The World Health Organization estimates that around 25 percent of all deaths in the developing world are directly attributable to environmental factors, and some researchers believe that pollution is responsible for up to 40 percent of global deaths annually. Fortunately, we can actively assist our body in the elimination of harmful toxins by harnessing those superfoods that have a powerful ability to cleanse and detox, such as organic chlorella powder. Chlorella is an alkalising super green – consuming organic chlorella powder thus ‘alkalises’ our body and corrects a state known as ‘acidosis’ in which many modern diseases thrive. The large amounts of protein found in organic chlorella powder bind to damaging heavy metals, ensuring faster and easier removal, whilst its substantial quantities of chlorophyll (it contains ten times more chlorophyll than spirulina), makes organic chlorella powder especially good at protecting our liver and cleansing our blood. In turn, clean blood ensures that metabolic waste is removed and eliminated from our bodily tissue. Recent animal studies clearly demonstrated that chlorella can protect mice from the heavy metal, cadmium, and helps to restore both liver structure and function. High blood pressure is known in the UK as the “silent killer”, because the condition rarely displays visible symptoms. According to the NHS, around 30 percent of people in England suffer from high blood pressure, although many are completely oblivious. If left untreated, raised blood pressure levels increase the risk of heart attack, stroke and kidney disease. Yet, whilst our chances of getting high blood pressure increase as we age, there are certain measures that we can take to decrease the threat, such as losing weight, exercising regularly, cutting down on alcohol, stopping smoking, and eating a healthy diet that is low in salt and caffeine. And studies have shown that organic chlorella powder can be an efficacious tool in lowering our blood pressure by improving our triglyceride and LDL cholesterol levels. Organic chlorella powder is also loaded with magnesium, a mineral that is essential for blood pressure regulation, healthy heart function and stroke prevention and which is widely lacking from our day-to-day diet (some 80 percent of Americans fail to receive enough magnesium). Scientific research conducted by T. Dyckner and P. Wester and published in the British Medical Journal reveals that patients undergoing long term diuretic treatment for arterial hypertension or congestive heart failure, who received a daily magnesium supplement for six months, saw a notable decrease in both their systolic and diastolic blood pressures. Although organic chlorella powder is pleasingly low in calories, it does remain a remarkably complete source of food nutritionally. This means that consuming small quantities of organic chlorella powder can help to satisfy our hunger and eliminate the type of food cravings that may lead to obesity. Recent research from Japan also suggests that organic chlorella powder has a strong ability to speed up our metabolism and increase our insulin sensitivity, resulting in lower overall body fat. And organic chlorella powder can aid in the balance of our endocrine system, ultimately creating an environment that is highly conducive to weight loss. Consuming anti-inflammatory organic chlorella powder provides our bodies with enzymes, pepsin and chlorophyllase, which stimulate the production of healthy flora, ‘friendly’ bacteria and probiotics in our bowels, resulting in a significantly improved digestion. It also means that organic chlorella powder is an effective aid in the battle against common digestive ailments, such as irritable bowel syndrome (IBS) and yeast infections like Candida. Superfoods, such as organic chlorella powder, which help us to achieve and maintain a healthy and well-nourished body, naturally leave us feeling full of renewed energy and vitality. Many insist that they profit from both increased energy levels and an improved mood after enjoying only a small dose of organic chlorella powder. So, what are you waiting for? 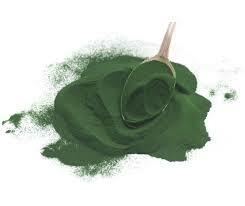 Isn’t it time that you considered adding organic chlorella powder to your daily diet? Chlorella is best enjoyed in its purest form – try either organic chlorella powder or organic chlorella tablets (that can be taken with a glass of water), as these are prepared from broken cell wall chlorella that encourage the rapid absorption of the super green’s many beneficial ingredients. Organic chlorella powder is an extremely versatile powder that can be mixed into your choice of smoothies, shakes, juices and protein drinks or as used as an additional ingredient in your favourite rawfood snacks and meals. It is, however, recommended that you start with a small dose of organic chlorella powder and gradually increase over the course of a few weeks to allow your body time to adjust. 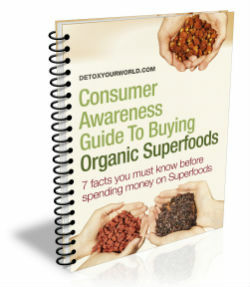 ← Choose carob for 3 fabulous health benefits! what would you say the differences are between Spirulina an Chlorella? Chlorella certainly makes the nicest looking (not) smoothies!